[back row, left to right] Nigel Eagers (South Gloucestershire and Stroud College), Dame Janet Trotter, Deputy Lord Lieutenant Robert Bernays, Cllr Mike Drew; [front row, left to right] Mark Shepherd and Michael Fautley. These people give up their time freely to help others and bring our communities together and they were rewarded for all their efforts at a special ceremony attended by the Chairman, Cllr Mike Drew and Dame Janet Trotter, the Lord Lieutenant of Gloucestershire. 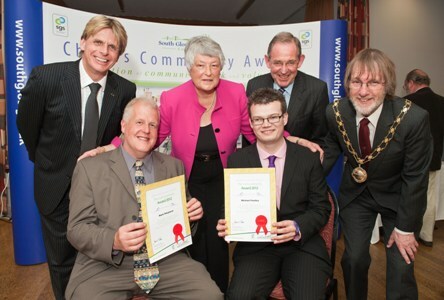 There were 28 winners in total who were presented with certificates by Cllr Mike Drew. Dame Janet Trotter, who attended for the first time in the event’s history, presented an award to Mark Shepherd and Michael Fautley for their valued services to community life in South Gloucestershire.